In the midst of widespread measures of admissions denials to undocumented students, and demands for proof of residency of passports when enrolling for classes, 16 undocumented Korean American students who had been accepted to UCSD succeeded in receiving the AB540 exemption with the help of KRC and others. 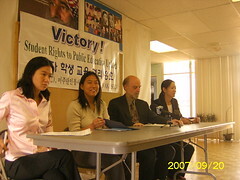 KRC and NAKASEC held a joint press conference and announced that 16 Korean American students who had been accepted to UCSD but had not receiving resident tuition support because of their illegal status had now enrolled to school. According to the AB540, enacted in 2001, undocumented students who attended high school for 3 or more years or had graduated high school are able to pay tuition for California residents when enrolling in a UC or CSU. But UCSD interpreted this law to apply only to those who entered the country illegally, and denied exemptions to those who became illegal as a result of having their visas expired. 300 students, including Korean Americans were denied the "resident tuition" exemption this summer. The different between resident and nonresident tuitions is about $17,000. According to Morna Ha, NAKASEc's Coordinator who had been negotiating with the school, other schools such as Cypress, Golden West, Ventura, are citing a federal law that prohibits education to tourist (B1) visa holders who do not change to a student visa (F1), and denying them admissions. Photo: KRC and NAKASEC staff hold a press conference about immigrant students' college admissions and their campaign for the right to AB540 resident tuition.